New Thread Quartet will be doing a livestream chat with composer Ben Hjertmann. We have been working on a commission project with Ben that is supported by New Music USA. At the time of the event our livestream will be available at http://www.newthreadquartet.com/. You are invited to join our discussion by submitting questions/comments via social media! Ben has created a new piece for saxophone quartet titled Sunstruck (originally titled Perpetuum Mobile). We will be premiering this stunning new 30-min piece on September 28 in Jersey City. To share the work and preview this concert, NTQ will do a livestream chat with Ben. We’ll discuss the piece, perform sections of it, and take your questions via social media. Sweet Soubrette’s last show before we lose our beloved violinist Heather to the West Coast! 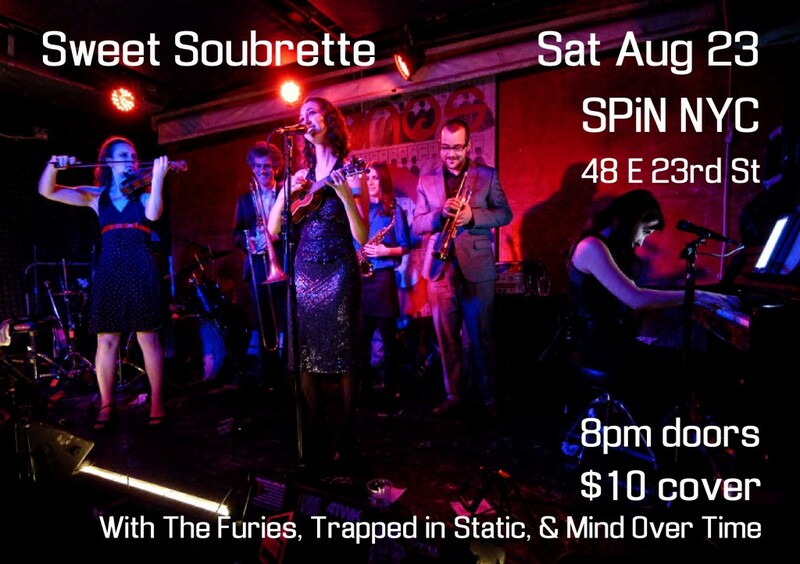 Come out on a Saturday night in September to see Sweet Soubrette in our full glory, brass section and all. 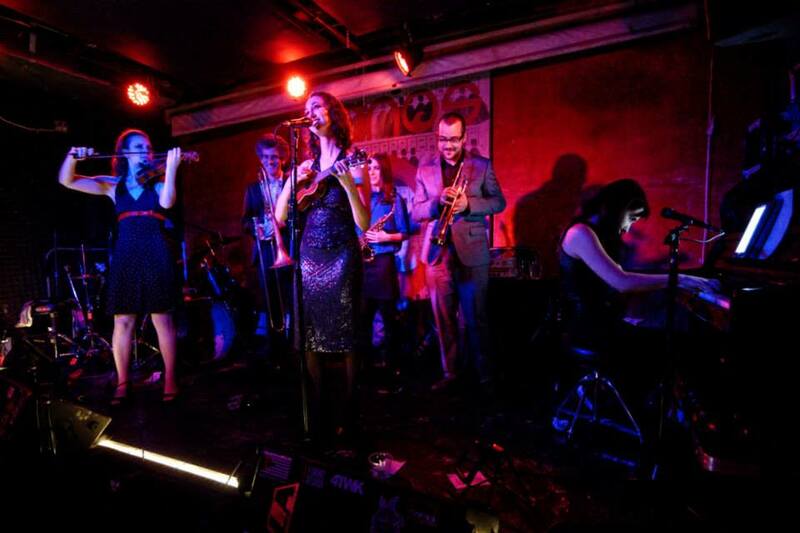 Last time we played as the big band, people danced up a storm. The same thing may happen to you. New Thread is collaborating with Iktus Duo (Chris Graham, percussion and Hristina Blagoeva, flute) to present a double bill concert for Con Vivo Music in Jersey City. We’ll be performing a classic piece by Caryl Florio, a recent work by Marcelo Lazcano, and two great electroacoustic pieces: Erin Rogers’ new work Mother Earth and Daniel Wohl’sMicrofluctuations in Plainchant. thingNY and our West Coast Counterparts in Noisemaking are having a steamy week together, taking over two spaces in two boroughs to try our hand at creating some durational performance art together. We’ll have some photos and video to share with you after this week. If you’re interested in attending our open rehearsal on Friday Aug. 29, send us a note:thingNY@gmail.com. Delighted to be playing saxes with the delectable Sweet Soubrette at Spin New York, the Manhattan ping pong club owned by Susan Sarandon, where we’ll be opening for touring act The Furies, an all-female indie rock band whose lead singer is known for her time with Third Eye Blind. This show is not to be missed!